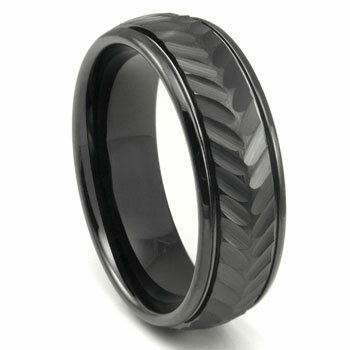 The black tungsten 8mm chevron newport wedding band is a TtitaniumKay.com specialty. This specialized wedding band is created from black tungsten, and Chevrons enscripted on the 8mm wide wedding ring. The design is known to be used on badges to indicate the rank in the military forces or on sleeves for length of service. This ring is made of the worlds strongest known metal so you can rest assured it will not scratch whether you work or play hard. As with all the jewelry we offer for sale, the men's wedding band comes with our 100% lifetime warranty.